Deja Nu Thrift Store relies on donations and volunteers to help it transform unwanted discards into a wide variety of attractive, affordable merchandise and, ultimately, funding for Chattanooga Humane Educational Society. Marian Roides is a believer. Last week, a little more than a month since Netflix debuted “Tidying Up with Marie Kondo” – its unlikely new hit show – the Hixson woman showed up at Deja Nu Thrift Shop with a load of discards and a big smile. The show is inspired by Kondo’s book — titled “The Life-Changing Magic of Tidying Up” – which made her a guru of decluttering and spawned the Kon Marie method of organization promoted in the Netflix‘s new shows. Her message, to “keep only those things that speak to the heart,” struck a chord with a virtual army of enthusiastic Netflix viewers across the nation. Mrs. Roides happily joined in. Further, like thousands of her fellow declutterers, she’s hauled her discards to a thrift store where they found a warm welcome. At Deja Nu, she reached into her trove of donations and pulled a like-new California Innovations collapsible cooler. Thanks to Deja Nu – which raises money for Chattanooga Humane Educational Society by converting unwanted discards into sought-after merchandise – the cooler got a new lease on life. The day after Mrs. Roides dropped off her castoffs, a delighted shopper spotted the container in the store and bought it on the spot. Donations and sales such as that are music to the ears of HES executive director Bob Citrullo and Deja Nu store manager Adrienne Koon. Deja Nu’s gross revenues average about $17,000 per month, Mr. Citrullo said. Since last March, the store has grossed a total of $182,000 in proceeds. That regular, reliable stream of revenue augments monies from the series of HES fundraisers held throughout the year, he said, and make it possible to afford to provide the life-saving surgeries and other expensive veterinary treatments needed by animals in its care. The profitability of the thrift store, which is operated on a shoestring, is due to a combination of factors: a wide assortment of donated (but tempting) merchandise; affordable prices; and clean, well organized display areas. The store, which sells about 3,000 items per week, has just two paid employees: Ms. Koon and store associate Robin Broom. To supplement their efforts, Deja Nu relies heavily on a dedicated group of volunteers who do everything from sorting incoming merchandise, to assembling furniture, to sweeping the floors and checking the bathrooms to make sure they have toilet paper. Some volunteers work just a few hours a week; others perform yeoman service. Robyn Cowan, for example, has donated more than 100 hours to the store since last March and Paula Shoffner – known throughout the organization as the “Book Lady” – a whopping 540 hours during the same time period. 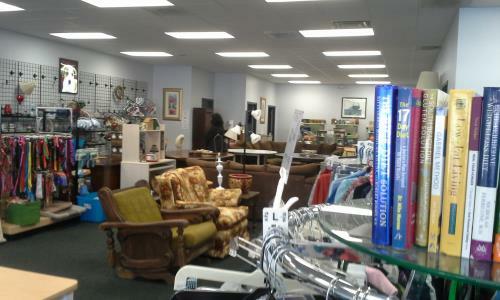 With a steady stream of sales and new donations, the thrift store is a constant work in progress. Its shelves are dotted with one-of-a-kind items such as the California Innovations cooler which often disappear within hours of being placed there. The No. 1 donated item, according to Ms. Koon, is clothing. Women’s clothes, men’s clothes and kids’ clothes in a vast variety of sizes and styles are readily available and, to make them even more attractive, frequently go on sale. Likewise, accessories such as jewelry, shoes and men’s ties show up in plentiful supply. The store also takes in large quantities of house wares, including cookware and decorative items; books, fiction and nonfiction, children’s and adults; and both new and gently used pet supplies ranging from beds, to toys, to bags of cat and dog food. Other popular categories include tools and sporting goods, Ms. Koon said, and furniture. “We can always use more furniture,” she noted.